The ASC Executive Committee voted to delay the Awards Program for one year. We did this to give us time to add new volunteers to the program and to train them. Also, the Committee believed that the Program needs review and more time for the award nominations and the selection process. This Program has been active since 1971 with 494 recipients. The 2017 shift of the Program from spring to fall revealed the need for a pause and an increase in the number of volunteers to enhance the quality and smoothness of the Program. We ask for your understanding. If you would like to volunteer to help us carry out our programs, feel free to call or send an email. We look forward to the 2019 Awards Program. 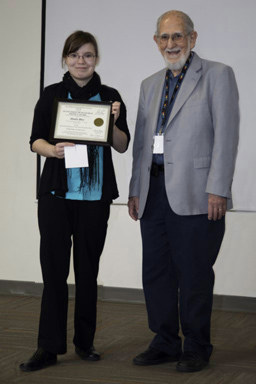 We recently announced the 2018 ASC Outstanding Montgomery County Science Day Student Project awardee, Ms. Emilee Weir, 11th Grade, of the Dayton Regional STEM School. icate and a monetary award. 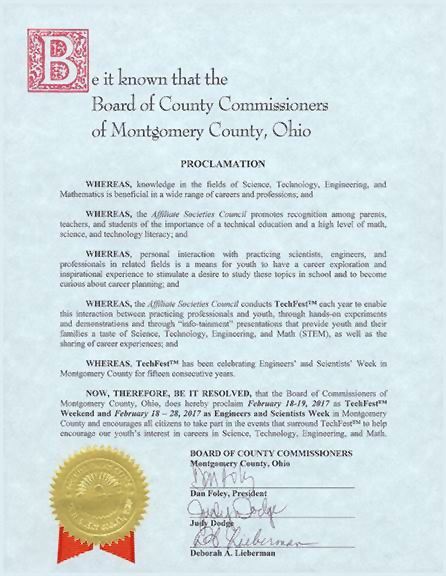 TechFest 2018 was held on the weekend of February 17-18 on the downtown Dayton campus of Sinclair Community College. There were 2285 registered student attendees. With parents, other adults and non-registered students, the total attendance is estimated to be around 4000. 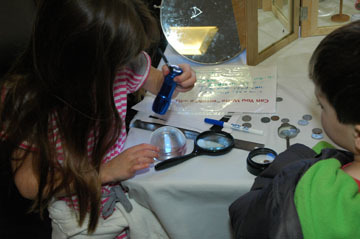 The success of TechFest is owed to the 74 exhibitors and their handson exhibits. The primary exhibit hall was the David Ponitz Center (Building 12). A Computer numerical control demonstration was held in Building 11. Manned, unmanned aerial systems and a wind tunnel were exhibited at the Unmanned Aerial Systems Center in Building 13 and indoor aerial flying demonstrations were seen in the Building 18 Flying Pavilion. Also demonstrated in Building 18 was a safety presentation on high and low voltage electricity. Attendees were able to travel between the Ponitz Center and Bldgs. 13 & 18 via overhead walkways. 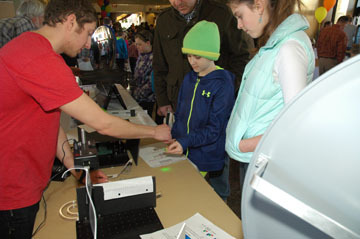 There were 10 exhibitors new to TechFest this year, including a team from the Office of Communications & External Relations, NASA Glenn Research Center in Cleveland and the University of Finley. 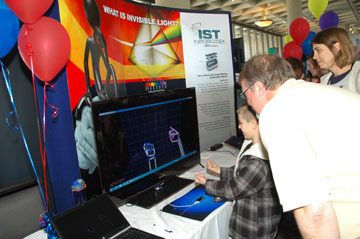 Go to TechFest for the lists of exhibitors, sponsors and the two-day program. Jim McCutcheon, a presenter who has been with TechFest since we started in 2003, was honored with the 2017 Governorï¿½s Award for the Arts in Ohio in Arts Education. Click here for the announcement. 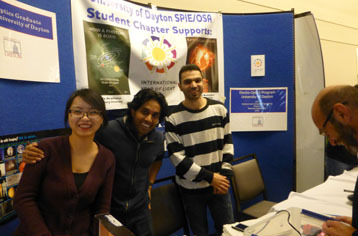 The Affiliate Societies Council (ASC) and its TechFest Team received the 2010 Wilson Charbonneaux Award from the Engineers Club of Dayton for their efforts to make science and technology understandable to the general public. See the new "Member Services"